4—GEAR Production Supplement F E A T U R E M achining processes evolve over time, some to a greater extent than others. In gear manufacturing, grinding technology has shown particular growth, with advances in both machines and abrasives delivering more stability, greater material removal and longer tool life than ever before. In fact, with grinding machines now able to produce a gear straight from a blank all the way to a finished product, some shops no longer perform other traditional gear manufacturing processes, instead choosing to invest their time and capital in grinding machines alone. 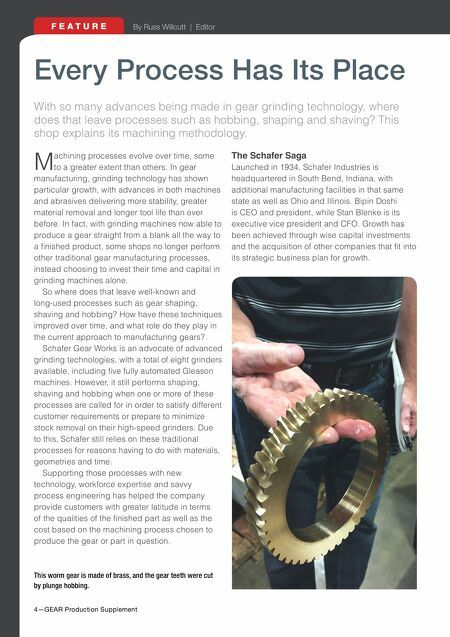 So where does that leave well-known and long-used processes such as gear shaping, shaving and hobbing? How have these techniques improved over time, and what role do they play in the current approach to manufacturing gears? 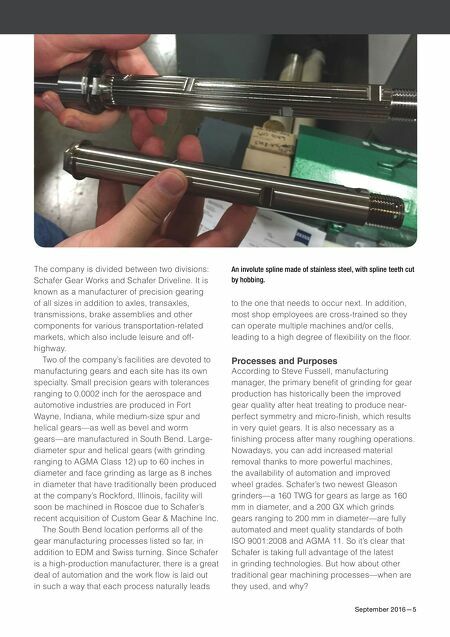 Schafer Gear Works is an advocate of advanced grinding technologies, with a total of eight grinders available, including five fully automated Gleason machines. However, it still performs shaping, shaving and hobbing when one or more of these processes are called for in order to satisfy different customer requirements or prepare to minimize stock removal on their high-speed grinders. Due to this, Schafer still relies on these traditional processes for reasons having to do with materials, geometries and time. Supporting those processes with new technology, workforce expertise and savvy process engineering has helped the company provide customers with greater latitude in terms of the qualities of the finished part as well as the cost based on the machining process chosen to produce the gear or part in question. Every Process Has Its Place With so many advances being made in gear grinding technology, where does that leave processes such as hobbing, shaping and shaving? This shop explains its machining methodology. The Schafer Saga Launched in 1934, Schafer Industries is headquartered in South Bend, Indiana, with additional manufacturing facilities in that same state as well as Ohio and Illinois. Bipin Doshi is CEO and president, while Stan Blenke is its executive vice president and CFO. Growth has been achieved through wise capital investments and the acquisition of other companies that fit into its strategic business plan for growth. This worm gear is made of brass, and the gear teeth were cut by plunge hobbing.